Blessing of the Roads was first coordinated by RoadWise in 1999. It is a statewide community road safety campaign run in the lead up to and during the Easter long weekend, when many people travel long distances to visit family, friends or holiday destinations. The Blessing of the Roads campaign is aligned with Towards Zero, WA’s road safety strategy 2008 – 2020, which follows the globally-recognised safe system approach to work towards a long term vision of a road transport system where crashes resulting in death or serious injury are virtually eliminated. As such, the Blessing of the Roads campaign intends to build community support for the long term vision and actions to achieve zero deaths and serious injuries from road crashes. Blessing of the Roads is non-denominational and can be embraced from a non-religious perspective. Sweden Sverige, Vision Zero Traffic Safety by Sweden, http://www.visionzeroinitiative.com/,6 December 2017. To help create a zero-focused culture among those who design and build roads and vehicles, and those who use the road network. Promote working together to prevent road trauma. Provoke the thought that we should not be willing to accept that anyone should die or be seriously injured on our roads. Provide an opportunity to remember those who have died or been seriously injured in a road crash to drive actions which change the results into the future. Recognise the dedication and effort of those, both full-time and volunteers, who work towards reducing road trauma in WA. Allow communities to support the actions and steps Local Governments are taking which prioritise safety outcomes, such as implementing road safety policies. WALGA’s RoadWise has prepared resources and tools to assist organisations to implement their campaign initiatives and disseminate road safety messages. To find out more information about the campaign resources, download a copy of the Blessing of the Road 2018 Campaign Kit or any of the following templates by completing the download form. RoadWise also has a range of road safety material available for loan. To view available resources and to book, please download the WALGA RoadWise Resource catalogue through the download form. For further information and/or assistance, contact your closest Road Safety Advisor. WALGA’s RoadWise would like to thank everyone who has participated in the Blessing of the Roads campaign since 1999. The Blessing of the Roads campaign has provided an opportunity for everyone to reflect on those who have died or been seriously injured in road crashes and encouraged others to be more road safety aware. By working together, organisations and the community can contribute to the long-term vision of zero fatalities and serious injuries on our roads. 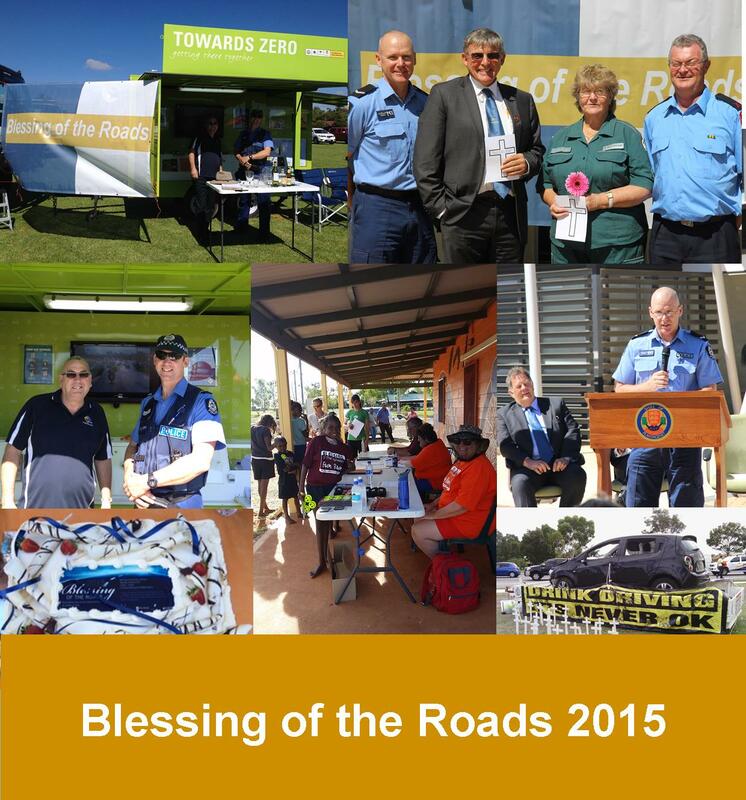 To obtain copies of Blessing of the Roads campaign reports, complete the download form. To view images from the 2018 Blessing of the Roads campaign, please visit the photo gallery. Cities of Joondalup, Stirling and Swan joint event. 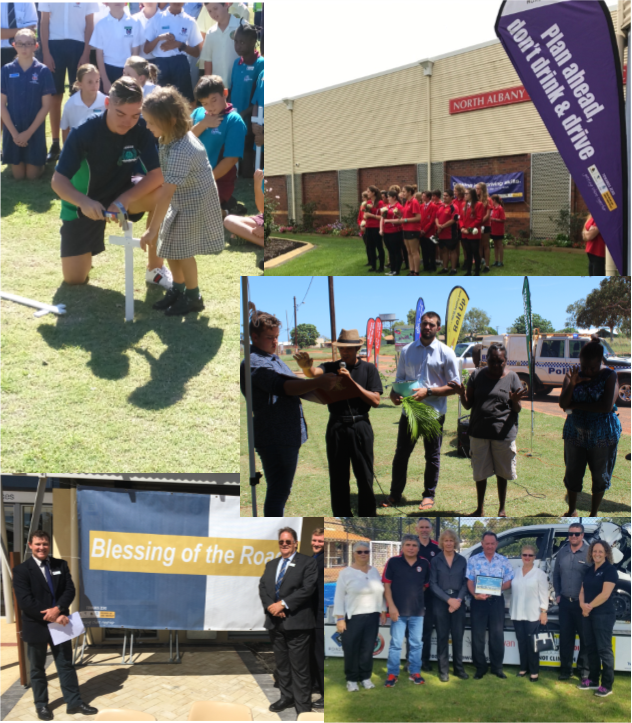 Pictured above, 2016 Blessing of the Roads campaign participants (clockwise from top left): Cities of Swan, Stirling and Joondalup event; Shire of Esperance; Shire of Cranbrook; the City of Wanneroo; City of Kalgoorlie-Boulder; City of Rockingham; Shire of Plantagenet; Shire Bruce Rock; Shire of Victoria Plains (New Norcia); and Shire of Carnarvon. Pictured above, 2015 Blessing of the Roads campaign participants (clockwise from left): Peter Denton and Snr Const. Jeff Osbourne at the Shire of Cranbrook's Blessing of the Roads event; First Class Constable Kevin Loveland, Len Handasyde, Elsa Drage and Jeff Drage at the Shire of Plantagenet Blessing of the Roads ceremony; First Class Constable Kevin Loveland addresses the Plantagenet ceremony (Shire President Cr Ken Clements in background), City of Wanneroo road safety display; Shire of Wiluna's Blessing of the Highway and fun run; The Cities of Joondalup, Stirling and Swan's Blessing of the Roads cake; and Peter Denton and Snr Const. Jeff Osbourne at the Shire of Cranbrook's Blessing of the Roads event. When is the next campaign? 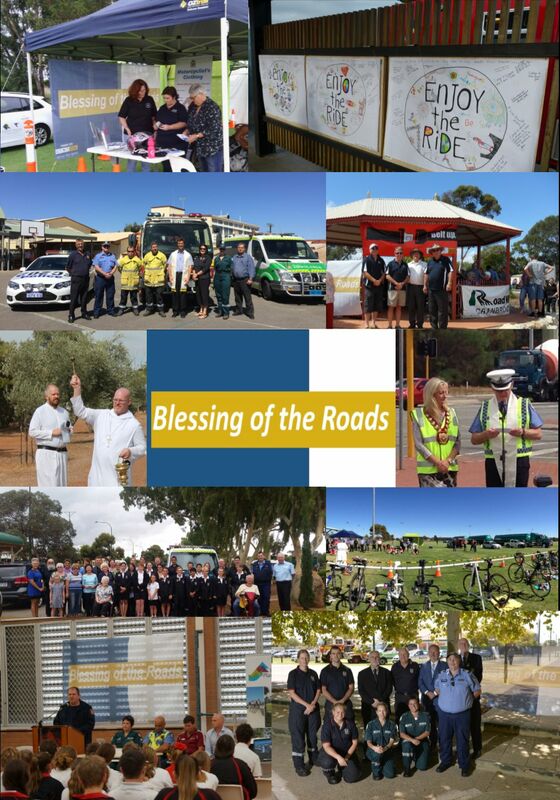 The 2020 Blessing of the Roads campaign will run in the lead up to and during the Easter long weekend (Friday, 10 April - Monday, 13 April 2020). For further information, contact your closest Road Safety Advisor.